George H. King died on July 2, 1876, in Pease Bottom, Montana Territory, where he was buried. In 1917, he was reinterred in the Custer National Cemetery on Crow Agency. He was a Corporal with Company A who who participated in the valley and hilltop fights. He was wounded in the left shoulder on the evening of June 25 and was later evacuated to the steamer Far West where he died. Francis Johnson Kennedy (left) married Mary E. Hogan (1961-1913) on July 2, 1882. He was a Private with Company I who was with the pack train and in the hilltop fight. John Hackett and Esther Smith were married on July 2, 1902. He was a Private in Company G who was wounded in the left arm during the valley and hilltop fights. William W. Lasley (right) died on July 2, 1924, in Washington, D.C., and was buried in the Soldiers’ Home National Cemetery there. He was a Private with Company K who participated in the hilltop fight. John Eaton Tourtellotte was born on July 3, 1833, in Windham, Connecticut. He was the Captain of Company G who was not present during the battle due to detached service. William Montell George, a Private in Company K, died aboard the Far West on July 3, 1876, of wounds he received during the hilltop fight. He was buried the following day beside the Yellowstone River in Montana Territory. Peter Orlando Barry died on July 3, 1909, in Morgan, Maryland, and was buried in the Morgan Chapel United Methodist Church Cemetery in Woodbine, Carroll County, Maryland. He was a Private in Company B who was not present at the battle due to detached service. Thomas Mower McDougall (left) died in Brandon, Vermont, on July 3, 1909, and was buried in Arlington National Cemetery in Arlington, Virginia. He was a Captain commanding Company B who was with the pack train and in the hilltop fight. Michael John Walsh died on July 3, 1932, in Newark, New Jersey. He was a Private with Company H who was not present at the battle due to confinement. William J. Logue was born on July 4, 1841, in New York, New York. He was a Private in Company L who was with the pack train and in the hilltop fight. 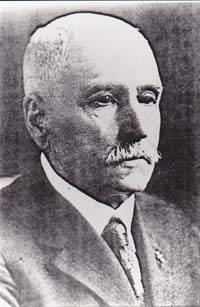 George C. Morris was born in Georgetown, Delaware, on July 4, 1851. He was a Corporal with Company I who was killed with Custer’s Column. Lansing A. Moore married Sarah Belcher on July 4, 1881, at Belcher Ranch, Custer County, Montana. He was a Private in Company F who was with the pack train and in the hilltop fight. William J. Gregg (left) was born on July 5, 1847, in Baltimore, Maryland. He was a Private in Company F who was with the pack train and in the hilltop fight. Walter O. Taylor was born in Scituate, Rhode Island, on July 5, 1854. He was a Blacksmith with Company G who participated in the valley and hilltop fights. James C. Bennett died on July 5, 1876, aboard the Far West. He was a Private in Company C who was with the pack train and in the hilltop fight. He was wounded in the chest during the second day of the battle. John Shauer died in Seattle, Washington, on July 7, 1924, and was buried in the Evergreen-Washelli Memorial Park there. He was a Private in Company K who participated in the hilltop fight. On July 4, 1876, news of the Battle of the Little Bighorn was reaching the east coast where Philadelphia was hosting the Centennial Exhibition. George H. King died on July 2, 1876, in Pease Bottom, Montana Territory, where he was buried. In 1917, he was reinterred in the Custer National Cemetery on Crow Agency. He was a Corporal with Company A who was wounded during the valley and hilltop fights. Thomas W. Stivers died in Kingston, Kentucky, on July 2, 1877, and was buried in the Richmond Cemetery in Richmond, Madison County, Kentucky. He was a Private in Company D who participated in the hilltop fight. William W. Lasley died on July 2, 1924, in Washington, D.C., and was buried in the Soldiers’ Home National Cemetery there. He was a Private with Company K who participated in the hilltop fight. John Eaton Tourtellotte was born on July 3, 1933, in Windham, Connecticut. He died on July 22, 1891, in LaCrosse, Wisconsin, and was buried in the Tourtellotte Cemetery in Thompson, Connecticut. He was the Captain of Company G who was not present during the battle due to detached service. Peter Orlando Barry died on July 3, 1907, in Morgan, Maryland, and was buried in the Morgan Chapel United Methodist Church Cemetery in Woodbine, Carroll County, Maryland. He was a Private in Company B who was not present at the battle due to detached service. Thomas Mower McDougall died in Brandon, Vermont, on July 3, 1907, and was buried in Arlington National Cemetery in Arlington, Virginia. He was a Captain commanding Company B who was with the pack train and in the hilltop fight. William J. Gregg was born on July 5, 1847, in Baltimore, Maryland. He was a Private in Company F who was with the pack train and in the hilltop fight. James C. Bennett died at 3:00 A.M. on July 5, 1876, aboard the Far West. He was a Private in Company C who was with the pack train and in the hilltop fight. He was wounded in the chest during the second day of the battle.